Featured image: Ships off Liverpool in the Great Storm of 1839, painted by Samuel Walters. 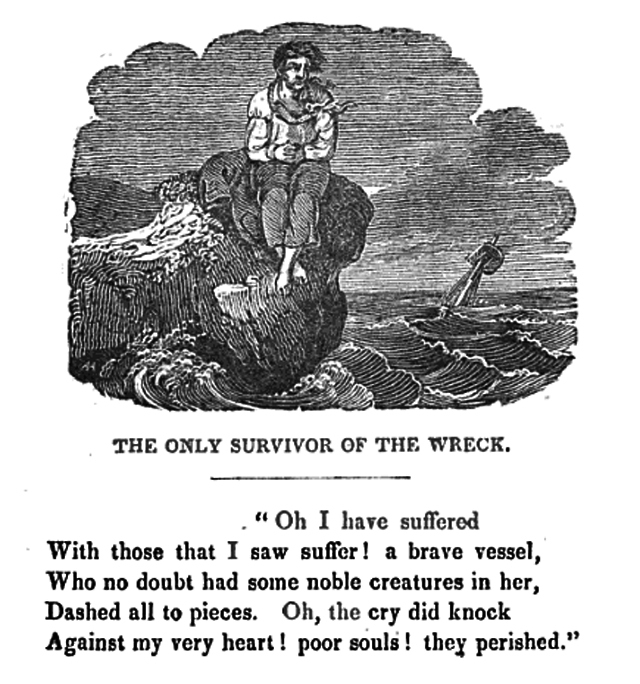 From: “Awful calamities: or, The shipwrecks of December 1839: “It has probably never fallen to the lot of the citizens of New England to witness or record so many terrible disasters by sea in the short period of fourteen days as have transpired within that length of time the present month. Three gales of unequalled fury and destructiveness have swept along our coast carrying desolation and death in their stormy pathway and overwhelming many families in the deepest mourning. Many who entered upon the month of December with a fair prospect of enjoying a happy new year and perhaps a long life now sleep in the bosom of the great deep with the seaweed wrapped around them or have been tossed on shore by the bellowing surges and all bruised and mangled have been followed perhaps by strangers to an untimely grave. Often as we have been called to weep with those who have wept over the sad wreck of human hope we have seldom met with any thing so well calculated to excite the sympathy of all the friends of humanity as the melancholy events which we have recorded below. On the night of Saturday, December 14 at about midnight a violent snow storm commenced along the coast and continued to rage until late on Monday. During a part of the time the snow gave place to a freezing rain. About 2 PM on Sunday the rain commenced and the wind at the same time rose to a gale, but it was not until 11 PM that the unprecedented and devastating hurricane broke upon the ill-fated shipping. From that time until 2 or 3 o’clock AM of Monday it continued a perfect tornado. It blew hard all Monday and Monday night but the most damage was done on Sunday night. The following is a list of the vessels wrecked or damaged as far as has been learned. Schooner Sea Flower with corn and flour on the beach, a total loss of the vessel and part of the cargo. Schooner Brilliant lost her main boom stern ripped down. The schooners Mary Swazey, JQ Adams, Plutus, Two Brothers and Burlington ran ashore on River Head Beach. The stern of a small craft was found on this beach, probably wrecked on one of the Islands at the mouth of the harbor. Mary Francis of Belfast, Warden. Just as the Custom House boat boarded her on Monday afternoon, her last cable parted and she went to sea. The boat took off the crew and two passengers. Schooner Walrus of Bucksport, wrecked at Pigeon Cove crew all perished, four bodies found. Cargo of corn flour. Schooner Eliza & Betsey of Mount Desert, driven ashore, crew saved. At Ipswich , schooner Deposit of Belfast with lumber went ashore on Lakeman’s beach, four lost, two men and one woman saved. Such is believed to be a very correct account of the destruction caused by the first storm, and who in looking over the extended list can fail to perceive that it was one wide scene of devastation along the whole eastern coast of Massachusetts.